Artificial peony flowers are among our favorites – they are just so sophisticated and elegant. They are of the genus Paeonia in real life – and are native of western North America, Europe and Asia. The name originally came from (as so many do) from Greek legend. Specifically Paeon a student of the Greek God of healing. When the God became jealous, Zeus turned Paeon into a flower to avoid the God killing him. Silk Peonies are one of the most beautiful faux flowers with lush foliage that will surely make an impression. They work well with various other flowers such as roses and irises to create the most stunning bouquets and arrangements for your home. You can find them in 4 natural colors: pink, red, white, and yellow, though their foliage handles dye extremely well so you can find interesting color combinations. Another huge benefit of artificial flowers of flower is the fact that they require little to no maintenance, making them the perfect selection for people that find it difficult to take care of flowers. The 38” Giant Peony Silk Flower Arrangement – Red is a stunning arrangement of peonies that shows the beauty of the flower through all stages of bloom. 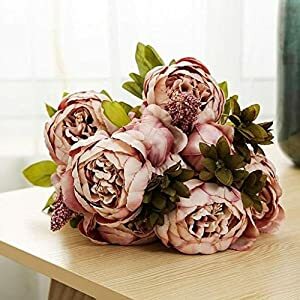 With the smaller developing blossoms and the fully blossomed flower heads, it creates a versatile arrangement that will compliment the interior design of any room in your home. Red peonies are a phenomenal display and can double as both a gift for a loved one or a way to add a little bit of color into an otherwise bland room. The brilliant green foliage creates a spectacular foundation for the bright red petals and small light green peony buds. In our range they come in vases, as stems (wonderful for creating your own arrangements, bouquets (lovely for weddings) parties or gorgeous in your home to enhance your decor. Please enjoy our faux peony flowers – a hassle free choice for any season.